Balls has been all over the TV today and in the Sunday Times today. I thought he looked clueless in the admittedly short clip of his Politics Show interview on the news. A big flip flop on cuts, attempts to cover this up with a rather fake sincerity (he shares Brown’s tin ear for what plays well on TV), just comes over as a very unattractive personality – a view clearly shared by his Sunday Times interviewer. He’s been at the centre of domestic policy since 1997 so where we are is his fault, his time is running out, the end of an awful careerist. This article in the FT by William White, ex public sector banker, makes the point that simple extrapolations of potential growth like this are an oversimplification and macroeconomic policy needs to look beyond short term crisis management. White argues that some industries will have significant overcapacity caused by above trend growth in recent years and structural adjustment will need to take place to take out excess capacity and allow these sectors to reduce production to lower levels commensurate with lower levels of demand. The role of fiscal stimulus is to facilitate adjustment, but implicitly the stimulus needs to be moderate and short term, lest we end up zombie economies like Japan. A good, old fashioned recession is like healthy forest fires which “burn away the undergrowth that might accumulate and make any eventual fire uncontrollable”. I wonder if Mr White is protected from the economic equivalents of natural selection, which he views so complacently, by a comfortable public sector pension. His metaphors from the natural world give us a clue as to what drives his muddled thought processes. I suspect that, like many who apply metaphors from the natural world (”survival of the fittest”) to the social sciences, his world view is unpleasantly Darwinist. The biggest confusion is between a short term demand deficiency caused by recession (what we are experiencing now across the board) and the need for declining industries whose day has passed to die off and allow reallocation of capital to more productive sectors (true of certain industries at any time). In a recession short term demand deficiency leads to loss of business confidence. Via the mechanism of destocking this feeds through to a vicious contraction in economic activity. When business confidence recovers, inventory is replaced leading to a sharp recovery in economic activity, which usually (though not always) kicks off a return towards long term trend growth. Unlike Mr White, I would argue that the role of government spending in a recession is to mitigate the worst part of the economic contraction and thereby ensure that economic capacity is not needlessly and wastefully destroyed, allowing a quicker return to trend growth. There are clear perils to oversimplifying this – for example in the 1970s economists and politicians in the UK arguably became transfixed by early and simplistic analysis of the trade off between unemployment and inflation and lost sight of the long run limitations of managing the economy solely by reference to this relationship. Associated with this, the need, for instance, for long run fiscal discipline and appropriate microeconomic policies was lost. But this is not where we are today. And simplistic analogies from the natural world are crass and misleading. I believe in the State’s core purpose: to regulate and arbitrate. I believe in the State’s power to do good; to bring justice, security and order; to defend and protect its citizens; and to make their lives better. I believe in the State’s duty to care for the needy; to ensure that the rich help the poor, and that the weak are helped by the strong. And I believe finally in the State’s nobility as an idea; the inspiring power of the national ideal; the tremendous possibilities unleashed by collective action; and the love and duty owed by citizens to the State. But the incontinent expansion of the State’s reach degrades its grip. It undermines legitimacy, lowers confidence and breeds disregard. Twelve years of new Labour’s flabby-minded growth in the public sector, and the bloating of its claims on individuals’ lives, have begun to rot the whole idea of something the Left ought to believe in, and the Right do: society, and the public good. What surprises me is the caution of the Tories’ attitude towards public spending. 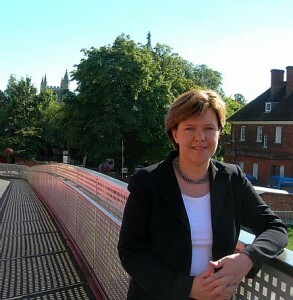 My only recent experience of the Tory frontbench was an event with the very likeable Maria Miller, shadow family minister. One of the firms present had a problem with Surestart funded Children’s Centres, (which although employing similar staff to their private competitors paid much higher wages), and the point was made that surely Surestart was on the list to be looked at with a highly sceptical eye. However, it became clear that Tory policy on Surestart was to start from the position that it was a good policy that needed supporting and improving. I’m not sure that I particularly like being in agreement with the Taxpayers Alliance but surely there must be a substantial risk that funding Children’s Centres to compete unfairly against private competitors is a wasteful policy which needs to be looked at intently. And incidentally, it will be interesting to see whether the Children, Schools and Families Committee get underneath what’s really going on with this particular policy. I prefer nobel laureate Paul Krugman’s more measured (and better informed) view. But let’s take a slightly later start date: in 1950, federal debt in the hands of the public was 80 percent of GDP, which is in the ballpark of what we’re looking at for 2019. By 1960 it was down to 46 percent — and I haven’t heard that anyone considered America a debt-crippled nation when JFK took office. So let’s keep it in proportion. As David Smith points out today, the economy in the UK has tended to do better in periods when public spending restraint has applied. Keep calm and carry on? Or panic and run around like a headless Guido…. This piece of research from Savills is interesting. The Savills thesis about the UK housing market is that it is increasingly driven by equity rather than debt, as the home owners who bought their houses in the ownership boom of the 197os and 1980s have paid down their mortgages. One strange effect of this is that wealthy home owners are actually using their clout in the market to crowd out owner occupiers. Since 1988, when the rental market was liberalised, private renting has grown from 9% of the market to 14% by 2008. Even in the mad days of the liquidity boom, when the famous 125% mortgages became available and non status mortgages became so common, owner occupation fell in the UK as high prices made it difficult for aspiting homeowners to get a foot on the ladder. With credit so restricted this isn’t going to change anytime soon. Came across this again the other day. I once had the opportunity to run Hague and his wife Ffion over by the traffic lights at Vauxhall Bridge. As a bonus, he was accompanied by one of our biggest competitors, a particularly nauseatingly self regarding oilslick of a man. I could have dropped the clutch, hit the accelerator and those weird strangulated vowels would never have been heard again. I suppose he’s going through a brief period as a national treasure, and that Pitt biography was right up there with Roy Jenkins on Churchill and the GOM as biography by a politician. But once he’s foreign secretary, we’ll remember just what a total dickhead he is (1 week left to save the pound, 1977 Tory party conference, etc etc). One of my friends, a banker who has done quite a lot of big stuff, pointed out to me today how things are up there in big deal land. You can’t get any bank to do more than a £25m hold and there’s no syndication market. You can’t club more then five banks together so you can only get £125m of senior into a deal. With a chunk of mezz, and a decent slug of equity maybe you can do a deal at up to enterprise £300m. Luckily all their portfolios are rubbish (2007 deals done at 12x EBITDA with 10 turns of debt) otherwise they’d have nothing to do all day. I have to confess that I thought that Adair Turner had gone out of his tiny priviliged mind (after all he is the man who until recently didn’t know what an Oyster card was) when I read the coverage of his comments about the social utility of much banking activity. Roger Bootle is very interesing though on the futility both of much current banking activity and ironically of attempts to ban the bonuses that it generates. The bonus debate is contemptible of course, led as it is by grandstanding politicians with no serious intent to reform banking , even if they are driven by a desire to assuage genuine popular anger. The solution is not intervention to suppress markets and regulate pay but rather intervention to help markets work better.